Make sure that the ignition to the car is in the off position. Disconnect both of your battery terminal connections, and turn the battery around 180 degrees. If it is not possible to turn the battery, the cables must be lengthened... somehow. Now connect the cable-that-leads-to-the-starter to the positive post on the battery. Position the ground cable so that it CAN be connected to the negative post of the battery, but do not connect it now. Remove the ammeter from the instrument panel leaving wiring connected (or crawl on the floor with head under dash and feel around...) and reverse the brown wire connections on the back side of the ammeter. (Later, it is easy to tell if you have done this correctly- if you did it correctly, it will read correctly. If you didn't get it right, the gauge will simply read "backwards". It will read "Discharge" when it is actually charging, and will read "Charge" when it is actually discharging. If you re-reverse this, it will work just fine. No damage will be done.) Replace the ammeter in the instrument panel. First, read the front of the tachometer. If it IS marked "Negative Earth" it probably IS negative earth already. But then, you probably wouldn't be swapping your car's electrical system, and wouldn't be reading this. If it is marked "Positive Earth", and there are no other labels on the back housing (notice this after removal of the tachometer from the instrument panel) indicating that it has been changed over, follow these instructions. Remove the tachometer from the instrument panel. Look at it carefully. Draw a picture of the orientation of the connections for wiring, attachment screws, note markings etc. and... most importantly... note and carefully draw a picture of the orientation of the loop of white wire running through the plastic holder. This will be reversed later in the instructions. Set the bezel, glass, shroud and seals aside to clean carefully before later replacement. Once the glass has been removed, be very careful not to disturb the needle, or leave fingerprints on the face of the tachometer. Turn the tachometer face down, looking at the backside. Refer to the drawing you made earlier. 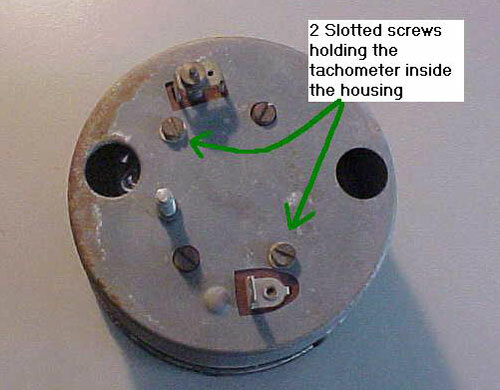 Locate the 2 slotted screws holding the mechanicals of the tachometer inside the outer housing. Unscrew them carefully, slowly, until they are almost free. Pick up the tachometer in one "soft" hand covered with a tissue to prevent fingerprinting-about-to-happen, and complete removing the screws. The tachometer "guts" will fall out into your tissue-covered hand, hopefully, and not onto the floor. Look carefully at the internal wiring connections. Look for the small 1/2 inch long brown, striped, diode. It is connected to the metal tab that provided electrical power into the tachometer. 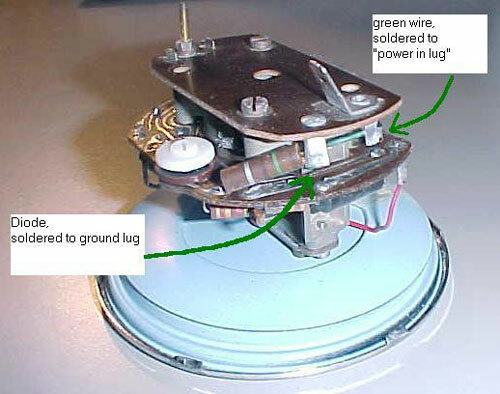 Nearby, look for the small green wire, soldered to a metal lug that connects to the metal internal frame of the tachometer, providing a ground. Unsolder these two connections, reverse the connections and solder in place. Do not use any more solder if you can avoid it. Just heat, remove, swap/replace, let cool. Now the small brown diode connects to the ground lug, and the thin green wire connects to the "power in" lug. This is now correctly wired for "Negative Earth", as is the picture below. Take the time to carefully dust off the tachometer face (a small artist's paintbrush is ideal for this). Replace the "tachometer guts" into the metal housing, taking care that any rubber shrouds for the marker lights are in position as the "tachometer guts" are lowered into position. Align the screw holes, and replace the screws. Clean the glass, shroud and bezel, and replace. CAREFULLY re-bend the bezel tabs to grip the tachometer body. Look carefully at the loop of wire that runs through a plastic holder on the back of the tachometer. This must be reversed, so that electricity "flows" the other direction. You can... follow the wires until you find connections and reverse them at that point. Or... you can carefully un-thread the white wire from the plastic loop holder, and re-thread it correctly, reversed "flow". Attach a small label to the backside of the tachometer housing stating the "modification to negative earth", Date it and initial it. Replace the tachometer into the instrument panel, re-attaching all wiring. Look at the wiring on the ignition coil. One side is probably marked SW (SWitch and the other is probably marked CB (Contact Breaker). Your ignition coil may be marked with a + (plus) and a - (minus), instead of SW and CB, as it may have had the coil replaced at some time. Reverse these wire connections. You will test this arrangement at the conclusion of these swaps, to ensure that the coil is wired correctly. If you got it wrong, the car will still run... but not as well. Now go back to the battery, and connect the ground cable connection to the negative side of the battery. Look at the Generator. You should see a large brown wire and a smaller wire connecting to a terminal marked F (for Field). Pull off the wire to the Field terminal. Connect a short jumper wire to the large brown connection (make sure you have metal-to-metal contact). Touch the jumper "lightly / slightly" to the Field terminal on the generator. You should see sparks, touch again (more sparks), and again (again more sparks). Now disconnect the jumper wire from the large brown connection, and re-connect the Field terminal wire. Your generator is now polarized. Testing Ignition Coil Wiring Reversal. You REALLY need to test this. With the ignition off, engine off, pull a spark plug wire loose from a spark plug. Place it loosely back in place. Now start the engine. Hold a no.2 lead pencil carefully in one hand. With the other hand, pull the loosened spark plug wire slowly away from the plug. You shoud see a good size spark jumping from the wire to the plug. Now... CAREFULLY place the sharpened lead point of the pencil into the path of the spark... you should see a "flare" of particles flying from the pencil lead TOWARDS the spark plug. If you see a "flare" of particles flying from the pencil lead TOWARDS the wire... you have the coil hooked up backwards. Remove the pencil lead from the spark path. Replace the wire. Shut the engine off, and re-reverse the coil low-tension wires and re-test. Get it right! Why does this matter? If you got this wrong, you will be losing about 50% of your voltage at the spark plugs! Weak spark! Essentially, if the ignition low tension coil wiring is reversed, the coil will... "pull" spark, rather than... "push" the spark. Electrons prefer to leave a high-temperature (high energy) surface (like the center electrode of the spark plug) rather than a low-temperature (low energy) surface (like the arm of the spark plug). More voltage (more spark) is available if the electrons move in the correct direction, in the direction they prefer, from the high-temperature center electrode of the spark plug to the (relatively) low-temperature arm of the spark plug. Test it! Get it right! Your car is now wired for negative ground (negative earth) electrics. You can install a new radio, tape player, CD player, radar detector, or even plug devices into your cigar lighter without worrying about frying components. Glenn Wallace supplied me with the diagram below, complete with calibration instructions. Thanks, Glenn. And here is a link to a really good instructional page for calibrating the Smiths Tachometer from the Classic Tiger Website. Very complete.